Leo woke up one night last week and no amount of cuddles or milk would settle him. So having work the next day and worrying about being up all night with him, I succumbed and allowed him to snuggle up in our bed. The next night Leo just would not go down in his cot, no matter what I did he just screamed. This for Leo is completely out of character as he usually goes down at 7pm with a bottle of milk and off to sleep he goes. He had even been sleeping through the night and I thought our sleep problems were well and truly behind us. He stood there in his cot holding his blankie and milk bottle tightly, and it suddenly dawned on me where he wanted to go. Our bed. So I took him through just to see what he would do and sure enough he began sucking on his blankie and drifting off to sleep. He didn’t care if I was by his side or not, so I left him to it and went down stairs (by this time it was already 9pm and my evening was gone) but when I came up to bed I moved him back to his cot. I suddenly thought that he may be wanting a bed and the cot was the issue, in hind sight I can see that this was not the right time for such a big change but we gave it a try. I got him a duvet and a new pillow with Mickey Mouse dotted all over it, and I had Luke take down the cot side and in it’s place put a bumper bar to keep him from rolling out. At bed time Leo refused to go in it and seemed really un-settled again. So I lay down with him on his big boy bed and we cuddled. I put on his Winnie the Pooh Light Show so that he could see it dancing around on the ceiling. But still nothing worked. In fact he got so clingy that I couldn’t even leave the room and I was waving goodbye to yet another evening of things I needed to get done. So I took him into our room – Third Fail. I had already decided that the cot bar was going back up as he quite obviously was not ready for that change just yet and I was even ready to pull out the big guns of controlled crying. I lay with my little man tickling his hand and holding him, and then I started to move away as I heard him starting to drift off to sleep. It was like he could detect when I got out of the door, with his alarm sounding making me come back in. When I eventually got downstairs I was adamant that I was going to get him back into his own bed and to going off to sleep without me. It is amazing how 2 nights can make such a difference to a routine and what the child expects from you. I moved Leo into his big boy bed around 11pm again just as I was going to bed, and he spent a matter of hours in there before he was awake and back in bed with Daddy and I. After finishing work the next day I got the Allen Keys and asked Luke to put the cot back together for me. Of course he decided not to help, told me that I should battle it out with him as he would have to do it eventually. My argument on this front is that he has demonstrated that he is not ready, and for me to get him back in his cot I was going to have to make sure he couldn’t get out, so that he would eventually go back off to sleep. So without Luke’s help I attempted to put the side back on only to get so far before he comes in and tells me that I have blunted all of the screw heads. 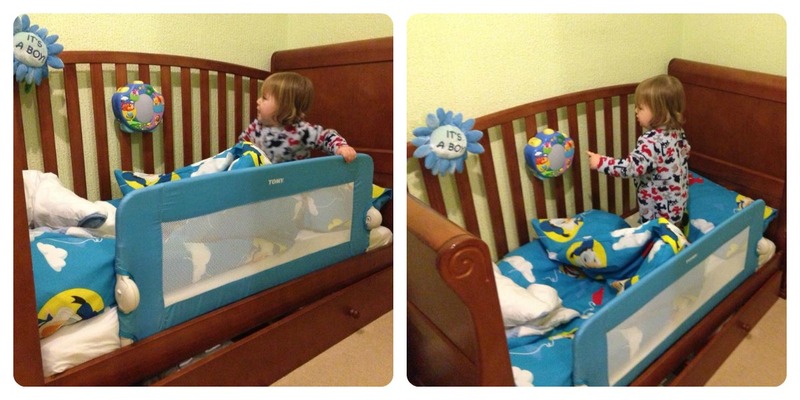 But eventually Luke had Leo’s cot back together and ready for Leo that evening. That night Leo screamed for 1 hour and 45 minutes. He stood up screaming at me for what felt like forever. 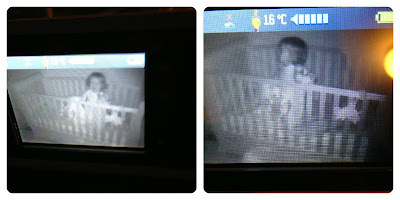 I wondered if he would give in and go to sleep as we hadn’t had to practice controlled crying for a very long time. Eventually he sat down in his cot, and then lay down before he fell asleep and slept all night long. The next night Leo cried for around an hour before falling asleep, I was anxious it would be longer as Luke and I had plans to go out. He was meant to be going to Granny’s house overnight but I decided that it would be best if she came to us so as not to disrupt his routine further. I knew if I didn’t have him fast asleep by the time Granny arrived she wouldn’t be able to leave him crying and would give into him. Luckily just before Granny arrived Leo was fast asleep and dreaming and didn’t even know we left. He slept all night long and was bright eyed and bushy tailed by morning. Saturday night Leo cried for around 20 minutes before drifting off and sleeping ALL night. Sunday night took less than 5 minutes before he was sleeping like a baby, all through the night! Monday night he went down just like he usually would, he let me tuck him in and even hover by the cot like I always do. Before I walked out of the room telling him I loved him. There were no tears, no screaming and he went straight off to sleep. Sleeping all night long. With each passing night there really was a difference in how long Leo was crying for until he was just back to normal. I have spoken on my views about controlledcrying before and how I felt about doing it. But now at 19 months old I have no problem in sleep training him. I feel he needs to know that bedtime is bedtime and he goes down to sleep in his cot (or bed…at some point in the future). I've had to come to the conclusion that my little one needed sleep more than she needed me hanging around waking her up with my every yawn, its so hard to know what to do for the best but I remember my health visitor had 4 kids and said they asleep trained two who concentrate well, sleep well and are rested, the two who they stayed up all night with struggle, hard but I'm starting to think teaching her good sleep is an important skill! We sleep trained Mads, well we kind of did but to be honest she was never the type that cried for hours at night anyway, she has always gone down ok. We definitely had to sleep train her to sleep in her cot during the day but she has been napping in there for about a year. We have had a bit of trouble with Rosie since she went in her big bed. She used to be a perfect sleeper but recently she takes ages to actually go to sleep (because she can just get back out) so we put a safety gate on her room. She still takes ages but she just plays in her rooms until she decides to go to sleep. Once she is asleep we open the gate, she got into the habit of coming into our room but she is a nightmare to sleep with, at first when we put her back through she would cry but now as soon as I hear her coming through to us I get up and put her back and she goes back to sleep. Also my partner Tom does exactly the same thing - you ask for his help and he says no but then will come through to tell you it's been done all wrong!! Infuriating!!! Sophie, it must be a man thing! Luke always does this too!